It was the mid-1960’s when the Beatles were big and the music was loud and catchy — “Yellow Submarine,” “Wild Thing,” “A Groovy Kind of Love,” “California Dreamin’,” and “When a Man Loves a Woman.” Music had a snappy beat back then and was easy to dance to. But to me, there was nothing like slow dancing to When a Man or My Girl and slow dancing with someone who held me tightly. 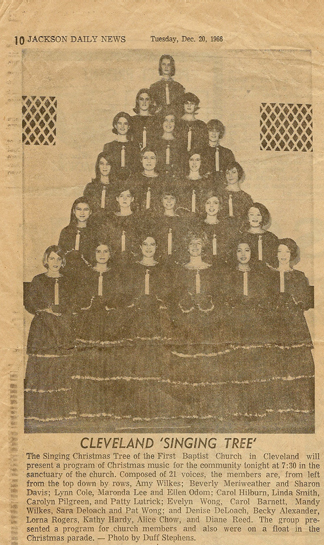 It was fall semester of my senior year in high school, and I was in the very first Singing Tree; the effort went on for several years after that. I sang second soprano and stood on the bottom row … where it was safe. The Tree was a part of the Cleveland Christmas Parade that winter. I seem to remember there was a problem. The stand was too high to clear the electric wires, and the top persons had to climb down and someone had to lift the wire so our float could pass under. I notice now four decades afterward that we got press in the Jackson Daily News. I didn’t know then how phenomenal that was, but I do know now. It was one thing to be in the local Bolivar Commercial, but the STATE paper — wow! That was big ink! I remember those girls, our extra part rehearsals, how our voices blended, how lovely the sopranos were, and how we sang our hearts out. Those days were beautiful days and the memories are sweet and precious. Be specific, a writer is told. 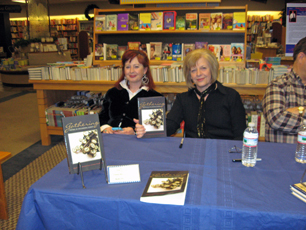 December has brought two opportunities for book signings. 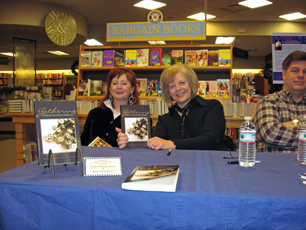 First on December 7, Currie Alexander Powers and I participated in Davis Kidd’s authors’ night series, Home for the Holidays, featuring the anthology Gathering: Writers of Williamson County. This was our first opportunity to take the book across county lines into Nashville. Several people stopped by to chat, we sold a few books, and we claimed the experience of being an “author” at DK. 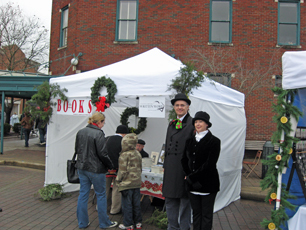 December 12-13 brought the annual Dickens for a Christmas celebration in downtown Franklin. 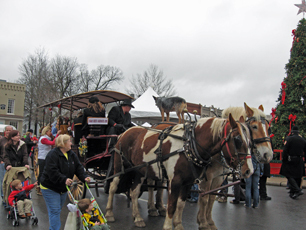 Characters from Dickens’ stories dress in period costumes, and folks enjoy music and food and displays of life as it was during Dickens’ time. I was thrilled to eat sugar plums and to watch Irish dancing on the stage by City Hall. CWW hosted a booth this year for the first time. 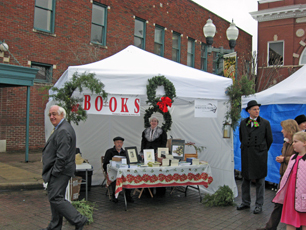 I’d suggested this during our first publicity committee meeting for the book Gathering: Writers of Williamson County — after all, Franklin is home, and Dickens brings 50,000 people to its streets for this weekend event. I thought we’d be able to sell some books. And we did jolly right well at that! That book was Muscadine Lines: A Southern Anthology. The writers were veterans of the first year of Muscadine Lines: A Southern Journal. 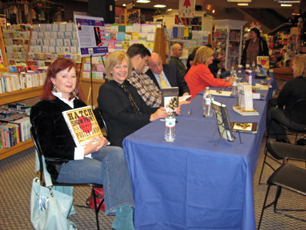 Up front, the writers were told how many books they needed to sell in order to recoup their costs of this print-on-demand process. We all had the knowledge needed to be successful. It was up to each individual writer to promote and sell books he/she ordered to claim that success. I think we all made it happen. While I’m just a lowly English major, I worked as Business Manager of the small company my husband owned. He was an engineer, a UT graduate, with a twenty-year career in management at the Alcoa headquarters in Pittsburgh and an MBA from Pitt. I had someone to run my own business dealings through if I needed to, I learned a lot from him, and a lot is just plain common sense. There are costs of doing business. There are editorial costs; there’s money laid out for artwork and book layout. There’s inventory — the stock of books on hand. It’s a constant seesaw — books ordered, books sold, costs repaid, profits made. It was as much fun to plan the business and marketing aspect of the project as it was to do the gathering and editing of stories. In 2008 others and I had a vision of publishing an anthology. This anthology, published in 2009, was sponsored by a literary org, CWW, of which I was a member and president at that time. It was all accomplished through committees and members in celebration of CWW’s tenth birthday. It’s a benchmark — a literary work of the literary org of Williamson County. Thirty-one writers are included in the book, some famously published, some published for the first time. The writers are somehow connected to CWW, whether through membership or literary Hall of Fame recipients. The book is a marketing tool for the organization; it contains valuable history of CWW, available to local citizens for the first time. It explains and defines what the organization does; it gives meaning and life to the work of a very small group of people who have labored diligently and sacrificed much over the course of the org’s short life to leave a legacy. It also fulfills the org’s mission: to encourage, educate, and empower writers. A writer’s organization now has its own beautiful book! This book is Gathering: Writers of Williamson County. A plan for success was explained to the membership; every detail was spelled out — sell every book of the original order at full price! ; status reports were given monthly. CWW ordered books; members ordered books. Excitement ruled as our launch party and purchases the following week generated enough sales to pay for our order. 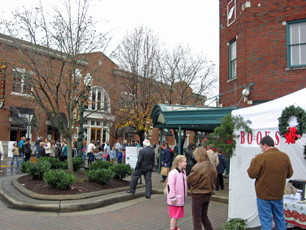 Sales at other events, including the Southern Festival of Books, began to chip away at amounts the leadership considered “costs of doing business.” Individual writers were encouraged to make their own sales calls, to have their own signings in their own corners of the county, to make press contacts and gain publicity for their works — and many did! We were on our way to success! I am proud to be one of 31 writers in Gathering. I am thankful for the opportunity of serving as co-editor, a thankless job that nobody else wanted, a job that required me to give days and weeks and months to editing stories, making sure the writers shined and voices came through, to ordering the stories, to composing the other components of the book, to writing the Introduction, to putting all the individual stories into one document, ready for a final proof and layout. Yes, it was hard work, and this was precious time I could have applied to my own writing, my own business of editing and publishing, my own work on a state and regional level. I am proud to have had a part in producing this literary legacy for my county and proud to be one small part in this fabulous book that belongs to us all. Now, I have passed on from leadership and moved onward with my work, I have passed the baton to others, and I had high hopes that they could also catch the vision and view this legacy with favorable eyes for the positive tool it was designed to be and is on track to be, and take it to the Promised Land. Tomorrow, I am happy to be included in an author gathering at Davis-Kidd in Nashville. I look forward to promoting this anthology of 31 writers and the org that empowered them and gave them voice. Last week’s jaunt deeper South took me down the Natchez Trace to Tupelo and then across Highway 6 through Oxford and Batesville to Clarksdale, where I hit the famous 61. It’s still cotton time in the Delta, and in places the road was lined with white, little fluffs that were blown off trailers and hang to edges of the asphalt. I traveled through fields of picked cotton, cotton still on the vine, active gins and compresses…and those cotton fluffs at the side of the road. It chokes me up to even think about it, and the tears flow freely. I think my blood must be white. Cotton was King when I was little. 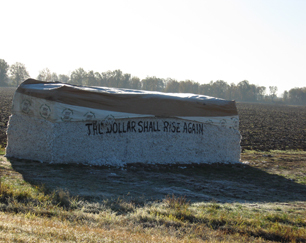 In Batesville, trailers of cotton had been dropped off for ginning, and I noticed plant yards full of them, all with messages spray-painted on the front sides. “I Am Sick of Healthcare.” “God bless America.” “The Dollar Shall Rise Again.” This was new! They didn’t used to do this when I was a little girl. 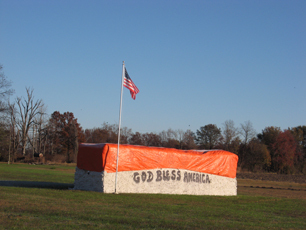 I found it funny and fascinating and made one of those violent stops on the side of the road to take some pictures — thoughts and concerns and prayerful thanksgiving of grassroots America. Free billboards.